Abstract : Chinese Ambassador to Tunisia Wang Wenbin said on Saturday that bilateral ties between China and Tunisia were deepened in 2018. TUNIS, Feb. 2 (Xinhua) -- Chinese Ambassador to Tunisia Wang Wenbin said on Saturday that bilateral ties between China and Tunisia were deepened in 2018. 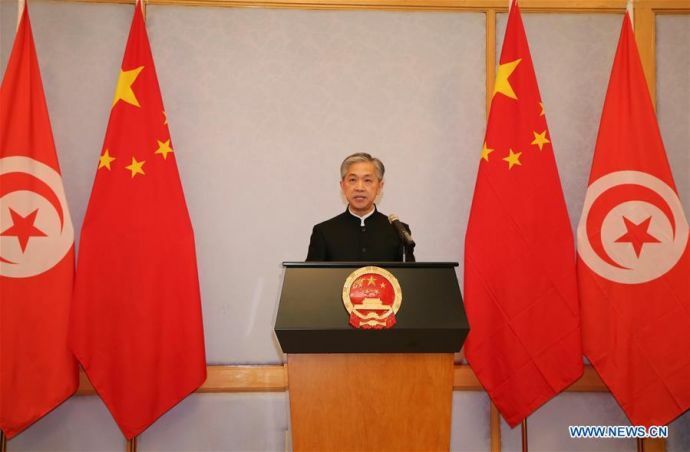 Wang made the remarks at a reception celebrating the upcoming Spring Festival in the Chinese Embassy in Tunisia, saying the two countries kept the momentum of high-level exchanges and signed a memorandum of understanding on the Belt and Road Initiative in 2018. The initiative, proposed by China in 2013, refers to the Silk Road Economic Belt and the 21st Century Maritime Silk Road, aimed at building a trade and infrastructure network connecting Asia with Europe and Africa along the ancient trade routes of the Silk Road. "In 2018, Tunisia and China promoted pragmatic cooperation in various fields," said Wang. Last year, Tunisia's first Confucius Institute (Institute of Chinese Language and Culture) was opened; the 23rd Chinese medical team arrived in Tunisia and continued to provide free medical services; and some 28,000 Chinese tourists visited Tunisia in 2018, said Wang. Over 300 people from local Chinese communities attended the reception. The Spring Festival, or the Lunar New Year, is the most important traditional celebration in the Chinese culture. It falls on Feb. 5 this year.